Shula Bowl Week is upon us. 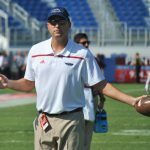 For FAU, facing FIU has more often than not been the cure for what’s ailing the football program. What do the Owls need to do to keep the Shula Bowl trophy in Boca Raton? ESPN West Palm’s Brian Rowitz and our Chuck King focus on that very question during the premier FAU football podcast. 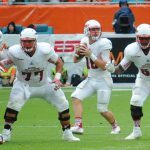 They also update FAU’s critical offensive line situation and dissect last week’s loss to Ball St.
You’ll also learn why “chaos” was the word used to predict what will happen on Saturday in Miami. The Owls are about to begin their second season – Conference USA play. Get ready for the action with OwlTalk.